It’s family game night so you pull out a few classics to teach the kids. Spending time with the kids is great, but you are actually doing much more by introducing them to games. Playing games offers all sorts of opportunities to educate. No matter what game you play, just explaining the rules teaches the child the concept of taking turns and rules structure. These are not always easy concepts for young children to learn as many kindergarten teachers will attest, yet games make taking turns and following rules part of an enjoyable experience. If you have ever been playing a game and seen a child’s eyes light up as they see their next move on the board and then shake with anticipation as they await their turn you can see your lessons come to fruition. What can you learn from specific games, however? What if your child isn’t ready to become a Chess prodigy? Checkers will help your child see spatial relationships and the concept of cause and effect as one move leads to multiple jumps. Dominoes obviously teaches counting as well as matching for very young children. If the child is old enough to read then a simplified version of Scrabble can reinforce spelling lessons, and the full game adds some basic math skills as you add up the points each round. And for more complex thinking, a game of Cluedo helps develop basic logic skills as they try to figure out the murderer by eliminating suspects. 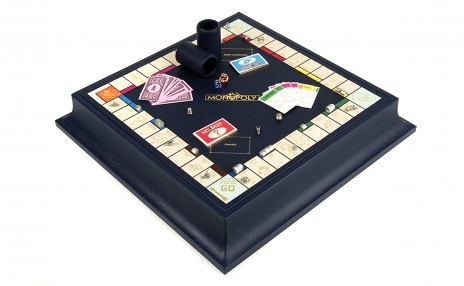 But let’s end by looking at perhaps the paradigmatic family game – Monopoly. What can we learn from this fairly simple game? To start their turn the child must roll two dice and add the results together – basic addition – then move their piece clockwise – direction – the equivalent number of spaces – counting. If they land on Chance or Community Chest they can practice their reading skills. If they land on a property then they must think about their budget and whether they can afford it – finance. Not surprisingly, real world financial concepts are everywhere in this game. Money, rent, and real estate are all part of the game, and if a parent was so inclined he or she could even try to explain inflation by pointing out the rather low prices. Next time a news report talks about a business having a monopoly, they’ll know what it means. As they acquire properties they’ll learn set collection and if anyone lands on one of their hotels they’ll have to read a table to determine how much money they’ll receive. If they play the way my family always did then they’ll also soon become skilled in the art of trading and negotiation. And they might even find it easier to remember how to spell Illinois or Pennsylvania after seeing it on a Monopoly board a few times. I’m not necessarily advocating making board games a central part of the school day but it’s hard to imagine too many classroom lessons that pack so much into an hour.